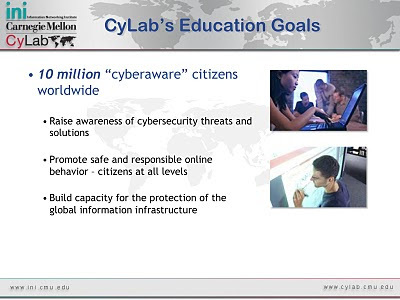 This is a brief excerpt from a presentation at the 7th Annual CyLab Partners Conference, held in at the Pittsburgh, PA. campus from September 29 through October 1, 2010. The CyLab Partners Conference provides an opportunity for cyber security leaders in business and government to immerse themselves in the latest developments drawn from CyLab's world-class research program. It is a benefit of membership in CyLab Corporate Partners Program. Full length videos of these talks, as well as a complete archive of researcher presentations, related student posters, etc. are available exclusively on the CyLab Partners Portal. Access to the Portal is given only to participants in the Partners Program.